Most of the variable frequency drives (VFD) below 600 HP or so are IGBT with Diodes to supply the DC. If only six pulse the harmonics can become a concern if a number of VFDs are used on the same bus. One of the jobs I'm currently trouble shooting has 6x600 HP VFDs all connected to the same power source. This means that my harmonics are added together as there are no filters or phase shifting transformers. I expect the power factor at full load to be around 0.97 or so. The issue with the connection of power factor correction anywhere on this source will be the potential for the Power Factor capacitors to be overloaded due to the harmonic currents. The harmonic currents flowing as a result of a six pulse VFD start with the 7th or 420 Hertz. Consider that the reactance of a capacitor is 1/2timesPItimesf means that the capacitor looks like a low impedance to the harmonic currents. About 20 percent of the full load current is added to the line for the 5th harmonic. That current will become a load to any capacitors connected to the source. The solution is to detune the capacitor or rate it as a filter capacitor and tune it to the harmonic that you wish to get rid off. The tuned or de-tuned capacitor will still act to correct power factor if that is what is needed. I have never connected capacitance to a power system without either a tuning or de-tuning reactor in series. The AFE VFD is the way to go if cost is not an issue. There a now a number of manufacturers that offer the AFE front end on their VFDs. In larger systems power factor and harmonic filtering can be at least partially avoided by using the AFE drive technology. 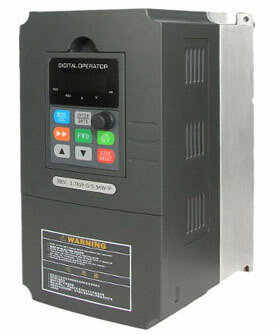 Almost all of the newer VFDs are voltage source type although the LCI (Load Commuted Inverter) is still being used in some very large applications. The front ends are usually 12, 18, or 24 pulse to avoid harmonic currents and the power factor can be fairly low depending on the motor speed and the load.